This trip was broken in to two main portions: Kiribati followed by the Marshall Islands with shorter stops in Osaka and Bangkok on the way back to BNE. A bit of background on Kiribati (pronounced Kir-ee-bas)— Kiribati is located approximately 2,400mi north east of Brisbane, Australia. Kiribati has a land area of approximately 811 square kilometers divided over 33 atolls and one island. These are subsequently spread over an area of over 3.5 million square kilometers. The capital, Tarawa is located over 2,300km from Kiritimati (Christmas Island), which lies almost directly east of Tarawa. They were formally known as the Gilbert Islands prior to independence in 1979. 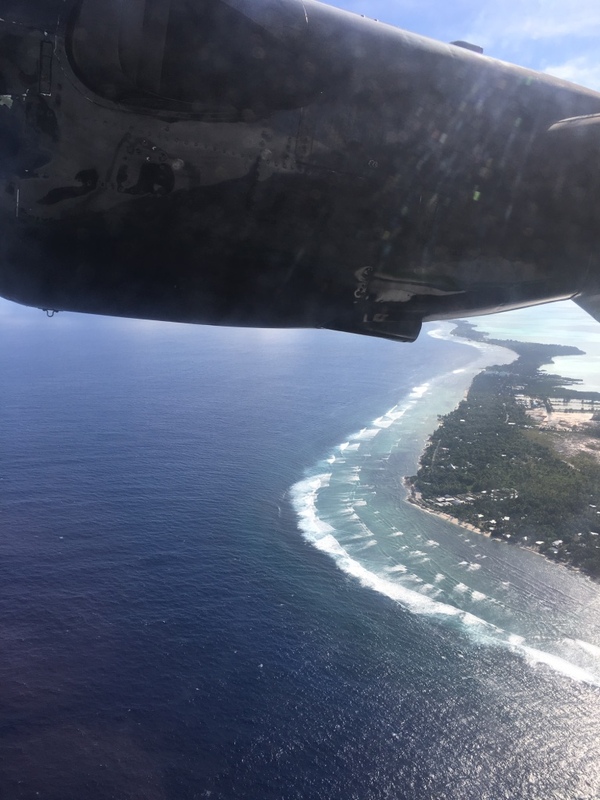 Getting to Tarawa from Brisbane is quite easy with options on Fiji Airways through NAN, Nauru Airlines through HIR/INU, and on Solomon Airlines in conjunction with Air Kiribati through HIR. 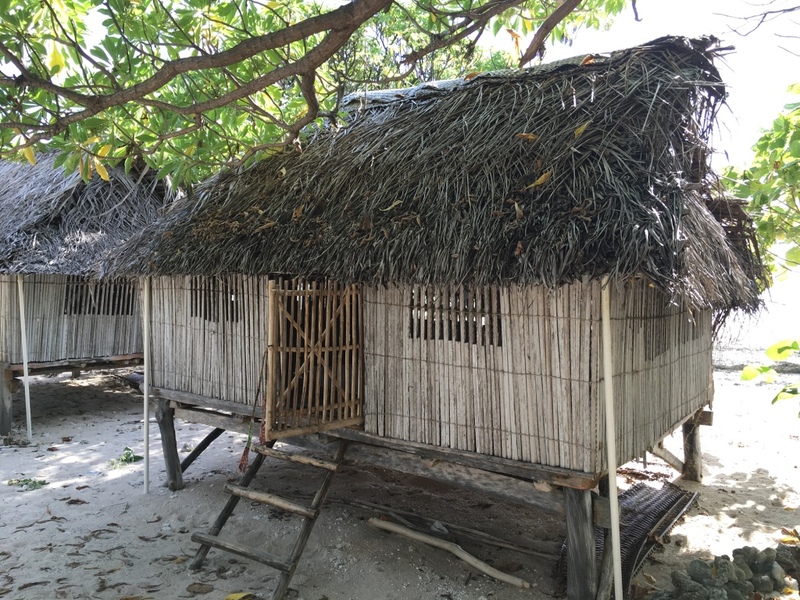 Domestic travel within Kiribati is a bit more challenging. 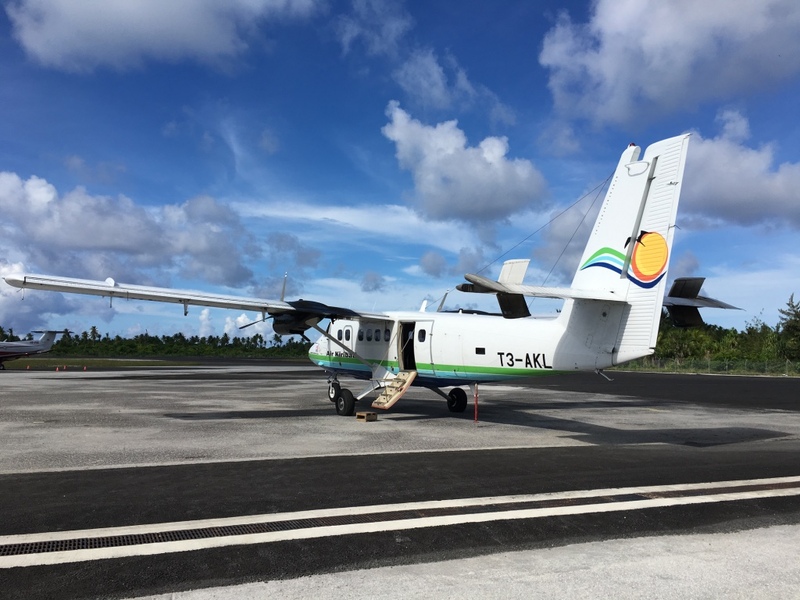 Air Kiribati Ltd, 4A at the time, now with the IATA code of IK with the launch of international services to Funafuti with a DHC8-102, T3-ALA.
Making reservations is a bit of an adventure as you have to contact the airline directly to request the current schedule, which in reality was more of a suggestion and the only sure way of knowing which flights will be operating is showing up at TRW. They do post the next days flights on their Facebook page most nights, but again, this is island time. Contacting the airline takes a bit of time, but you can eventually get confirmation through email and then pay for your flights upon arrival at TRW or you can arrange and pay through one of the few domestic travel agencies. The office was wonderful to deal with though we learned a valuable lesson upon arrival in TRW early on a June Friday morning. 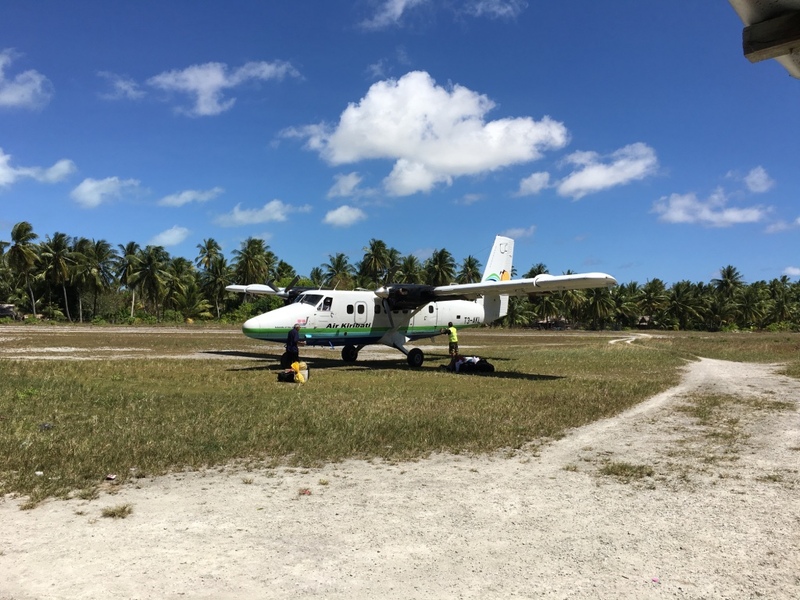 Unlike most other places, even in the Pacific, you are only confirming your outbound flight when you book through Air Kiribati’s Tarawa office. The inbound flights are the responsibility of the agent on the outer islands. A request is sent out to the agent, but they are ultimately responsible for confirming your seats. A note: this is in the process of changing, though as with anything, it’ll take time. 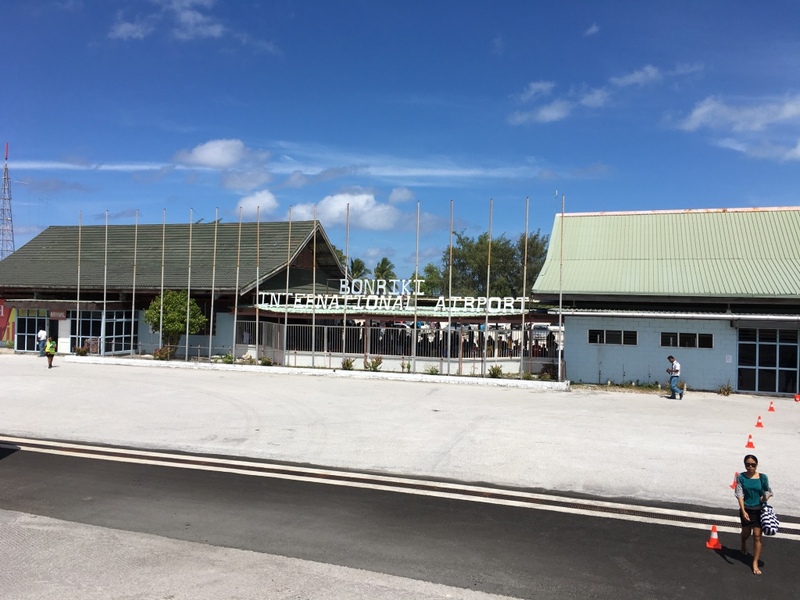 Bonriki International Airport is located at the widest portion of the atoll on the islet of Bonriki. 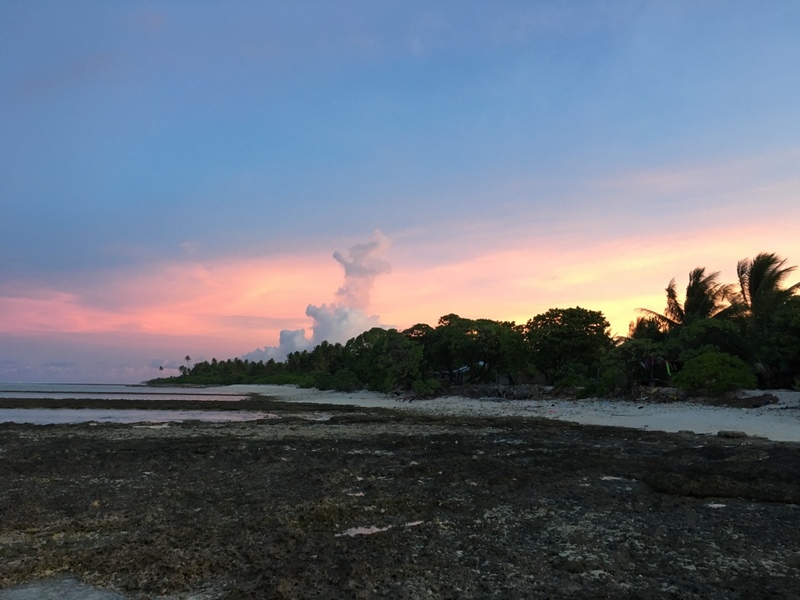 To the north is North Tarawa, a series of islets that are much less developed than South Tarawa, to the west of the airport. South Tarawa is home to Betio, a densely populated islet that was home to one of the bloodiest battles in the pacific theater. 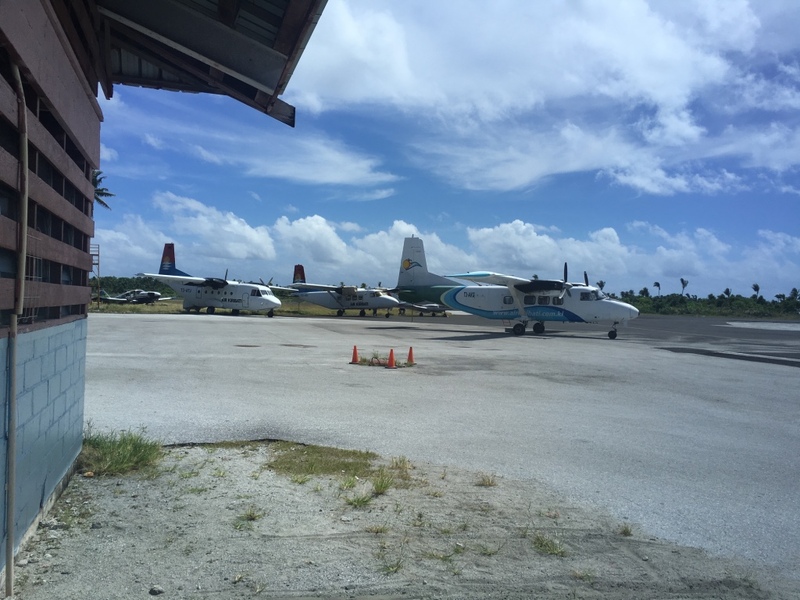 Bonriki International Airport is the busiest airport in Kiribati, home to Air Kiribati and Coral Sun Airways. There is a small terminal complex with two buildings, one each for arrivals/departures, connected by a covered outdoor area that serves as the waiting area for departing flights and those waiting for arriving flights. 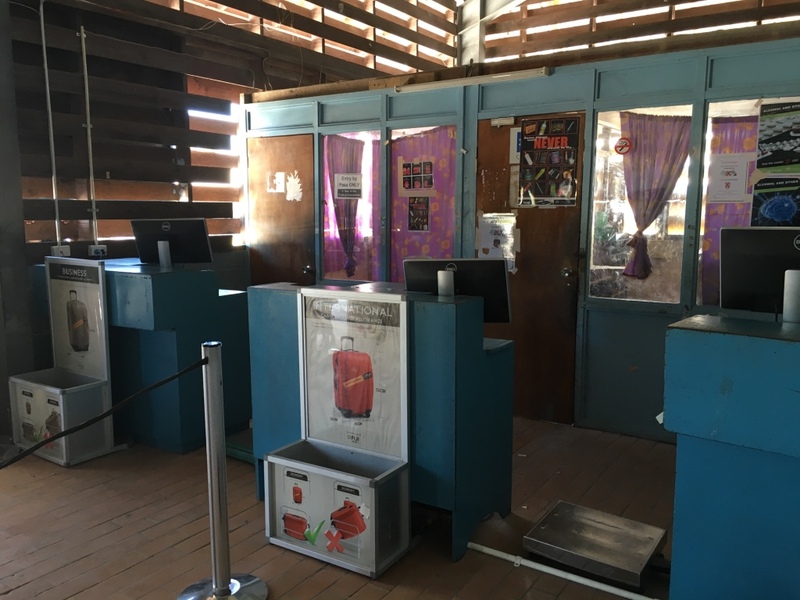 You can often find a crowd waiting in that area due to the unpredictable schedule of the flights arriving from the outer islands, let alone when there is an international flight scheduled to arrive. 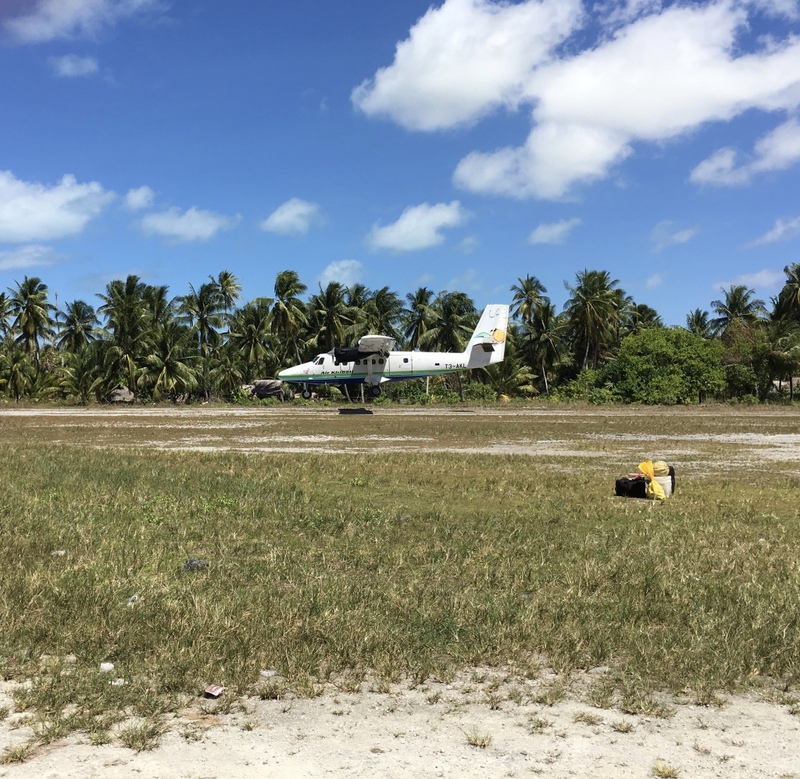 As part of our trip throughout the central Pacific, we booked a domestic round trip with Air Kiribati to the outer island of Abemama, approximately 124km (77mi) southeast of Tarawa. Our flight was scheduled to depart at 1600 with an arrival at AEA at 1630. We arrived at 1430, a bit ahead of out noted 1500 check-in. The handwritten ticket booklets were a great souvenir for the trip! 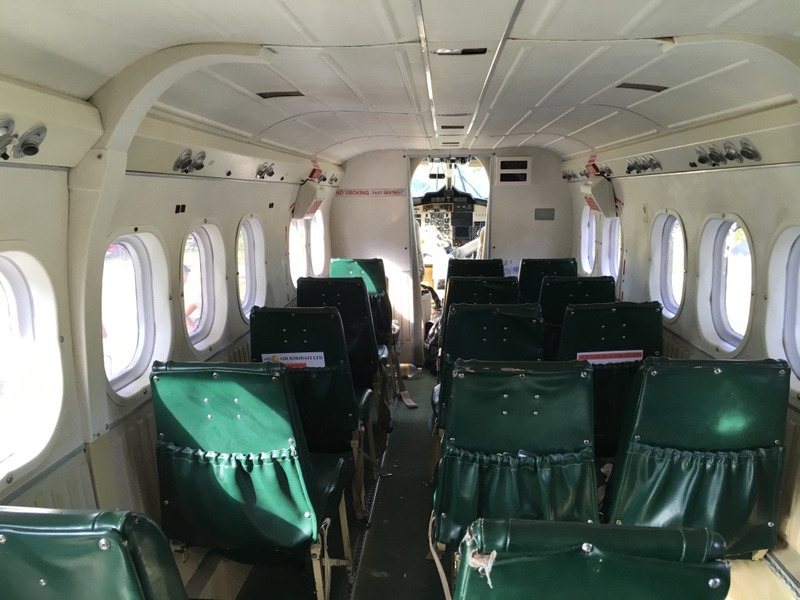 While our flight was noted as a DHC6 Twin Otter on the schedule, the office said the determination wasn’t made until the day of depending on a variety of factors. I was hoping for one of their two Harbin Y12’s. 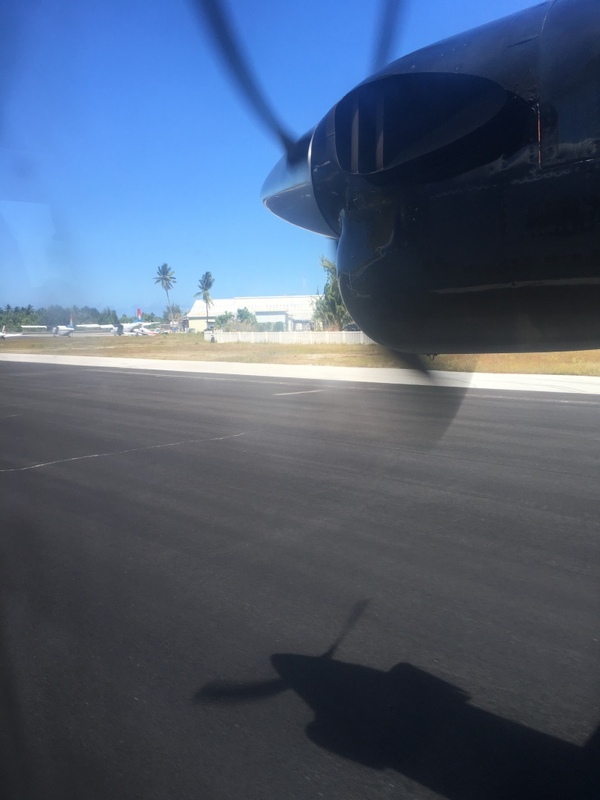 Air Kiribati has also been flying their Dash 8 to AEA over the past year. Check in was a quick process with everything being weighed, which presented an interesting challenge for my partner and I, as we were told to bring enough bottled water for our stay on the outer island due to a power outage at the time. This resulted in us leaving some belongings at our lodging in Tarawa and replacing that weight with extra water for the three nights away. With a quick check-in process completed, we set about wandering around the airport and waited for our flight to be called. We passed the time watching another domestic departure with the Y12 get prepped. Eventually, our flight was called and we were brought through to the tarmac. My partner and I were the first aboard and seated in 1BC, immediately behind the cockpit with a great view out the side window as well as the forward windows. 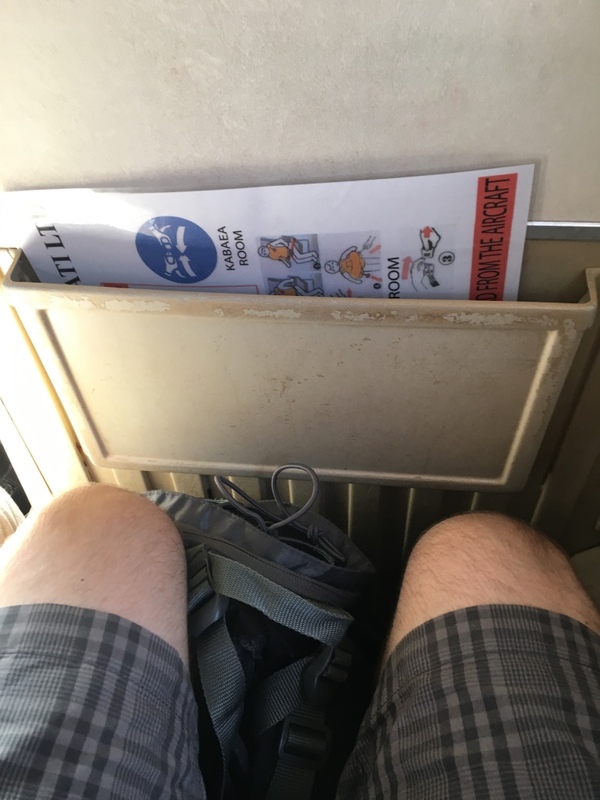 Legroom was standard for the Twin Otter, and perfectly ample for the 30 minute flight. With everyone aboard, there was a quick overview of the exits by the crew and we were off. 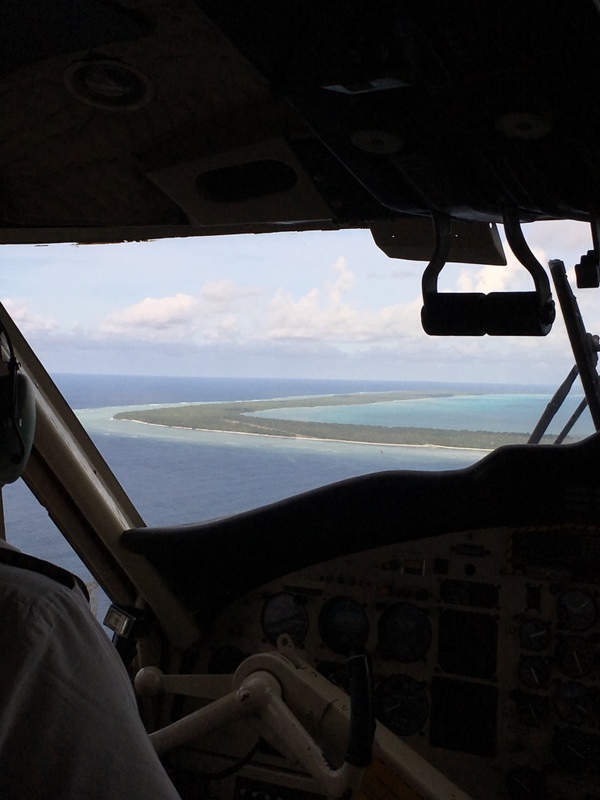 Flying in Kiribati was described to me by a former Air Kiribati pilot as essentially driving to the store. It’s very rare that there is any extreme weather and there are few features higher than a few meters to worry about when landing. The bigger concern on many of the outer islands are children and animals on the runway. After a short flight, Abemama appeared. It’s a traditional atoll, being long and thin with a lagoon side and an ocean side. 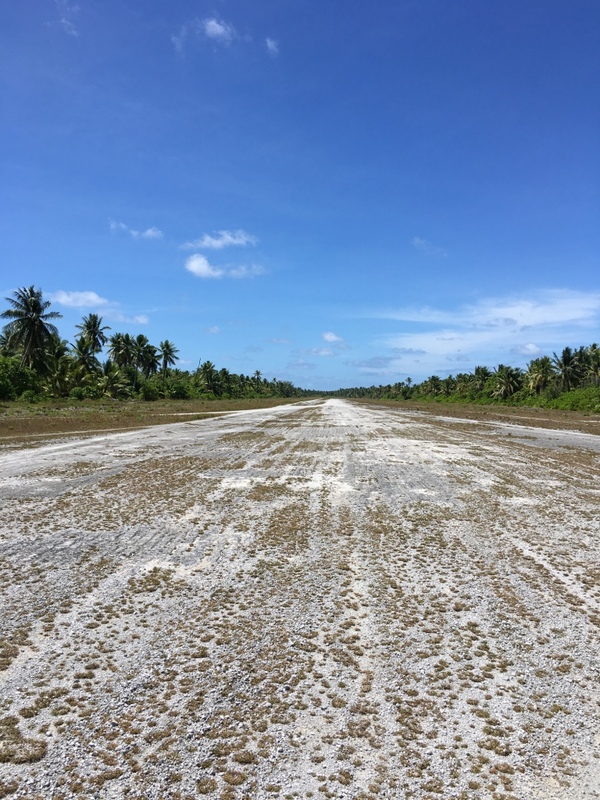 The airport is a small clearing with a few small buildings on the north end of the atoll. A smooth landing and were on the ground. Prior to leaving Australia, we had arranged our transport and accommodation with the help of the tourism office in Tarawa. 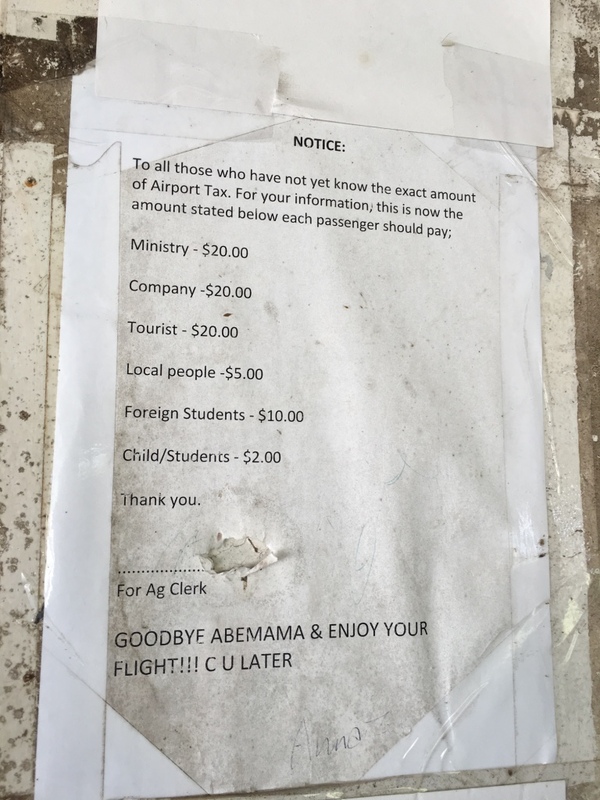 As we quickly learned upon stepping off the plane in Abemama, things operate quite differently outside of the main island. 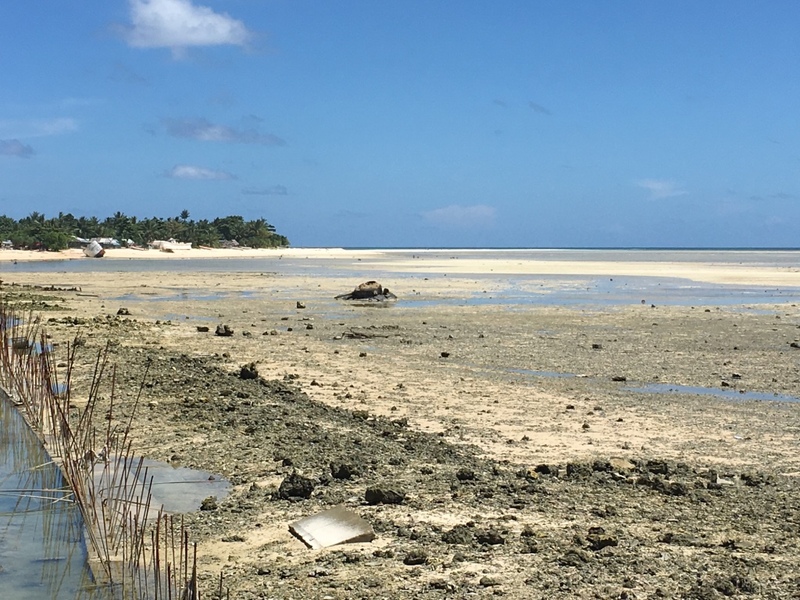 My first task was to ensure that we had seats back to Tarawa in three days time—which I promptly discovered we were ‘waitlisted for’. The ticket agent, a friendly yet strict septuagenarian, recorded our names in this large ledger and stated that there were four other foreigners also waitlisted for the same flight as our and ‘we will see’. With that, we set off to find the truck that was meant to pick us up, only to discover that there had been a mix up and we were without a ride. 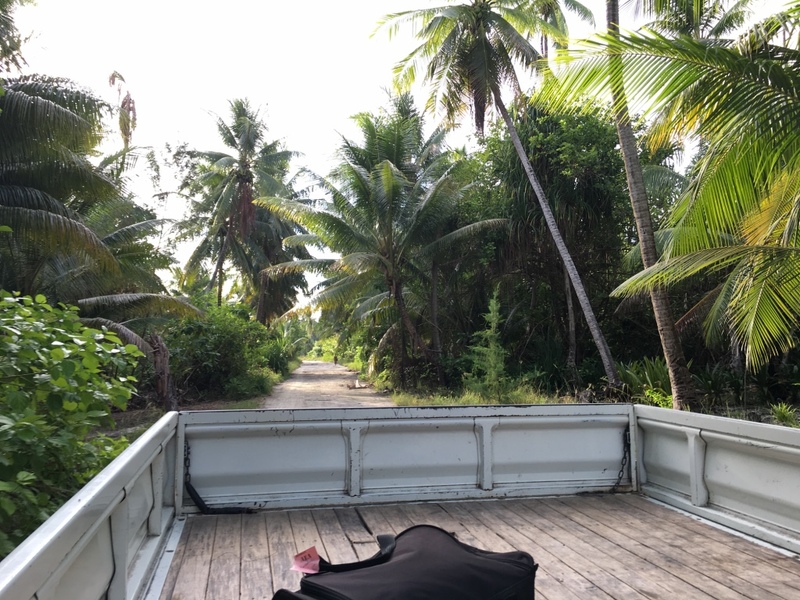 Thankfully, the island council driver offered to drop us off and we hopped in the back of the flatbed with a group of nuns. We came across the truck that was meant to pick us up halfway through our journey and transferred to that vehicle. After settling into our accommodation, we explored the rocks and settled in for a few days of tranquility. The history of Abemama is quite interesting with Robert Louis Stevenson spending time there as well as some fighting during WWII. After three nights in Abemama, we finally receive word that we will make it back to Tarawa, along with the other foreigners, on the date we originally planned. 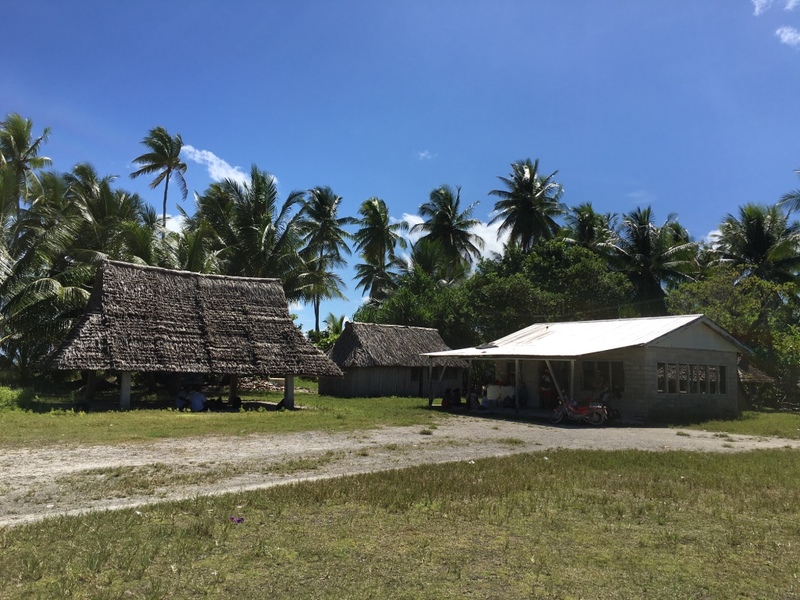 This is quite remarkable, as we later found out that while there are a decent amount of foreigners in Kiribati for assorted humanitarian purposes, the six of us represented majority of tourists in the country at that time. 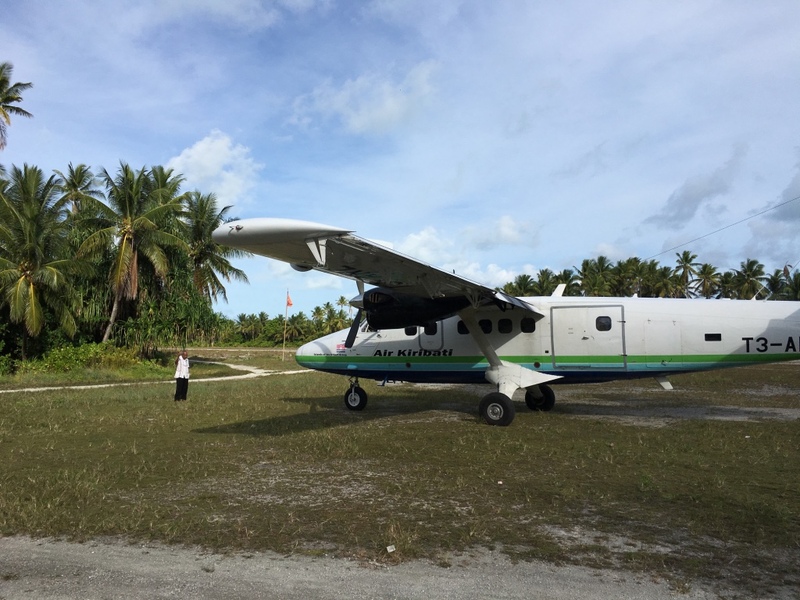 The flight that came for us originated on one of the islands in the extreme south of Kiribati and made an unscheduled stop to pick us up. We got to the airstrip quite early, as recommended by the agent, as there wasn’t an exact time known for the arrival. 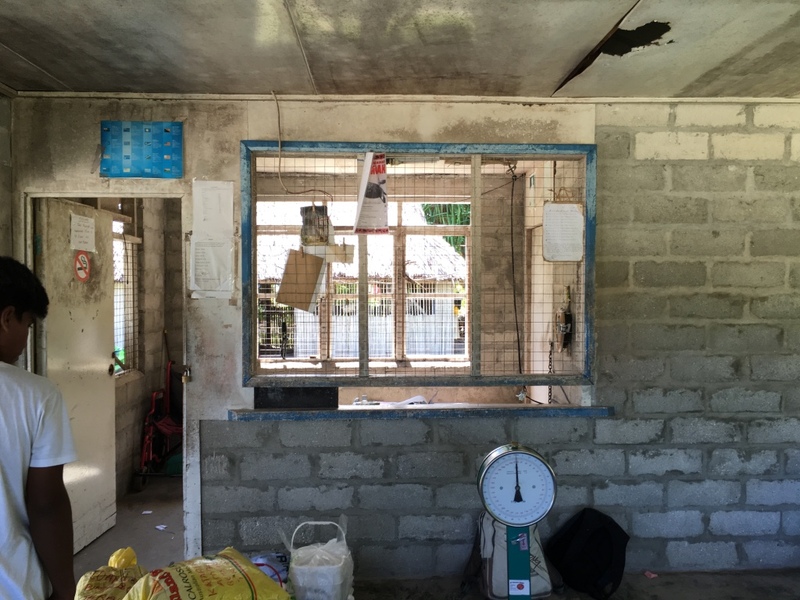 Check-in was an even more informal process than in Tarawa, with the biggest thing being paying our departure tax of $20 to the local council. With this completed, we set about passing the time. There is a small shop across the actual airstrip that had some soft drinks and snacks, but most of the time was spent walking to the waters edge and along the runway itself. The pumpkin joining us for the flight back to TRW. 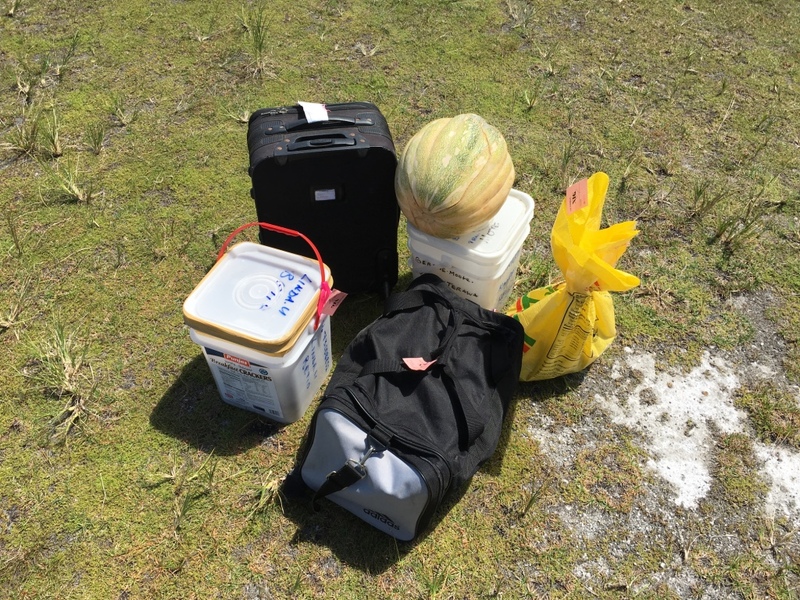 Note that the bags are all tagged to NIG/NGNU, Nikunau Airstrip on Nikunau Island because those were the only tags that were available at AEA. 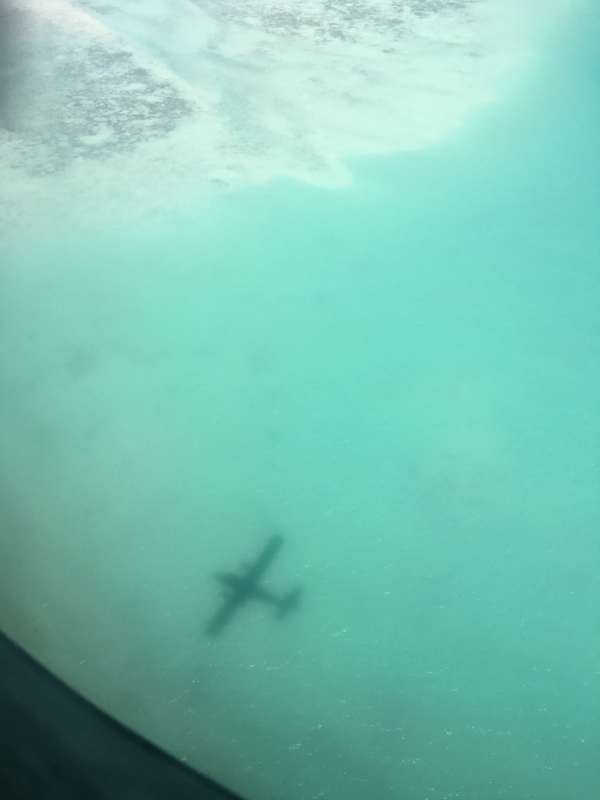 We eventually heard the radio call into the ticket agent from the inbound aircraft and 15 minutes later T3-AKL appeared over the water and settled onto the runway. It was a quick stop, with the #2 engine kept running while we got on board. 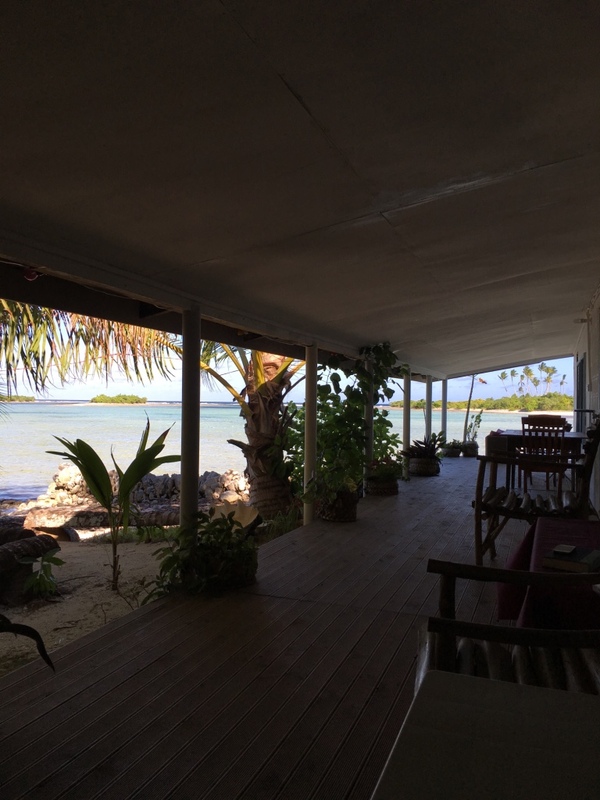 The door was quickly closed and we were off to Tarawa. After a short 30 minutes in the air, we Tarawa atoll appeared. A smooth landing led us to a fairly deserted Bonriki International Airport. 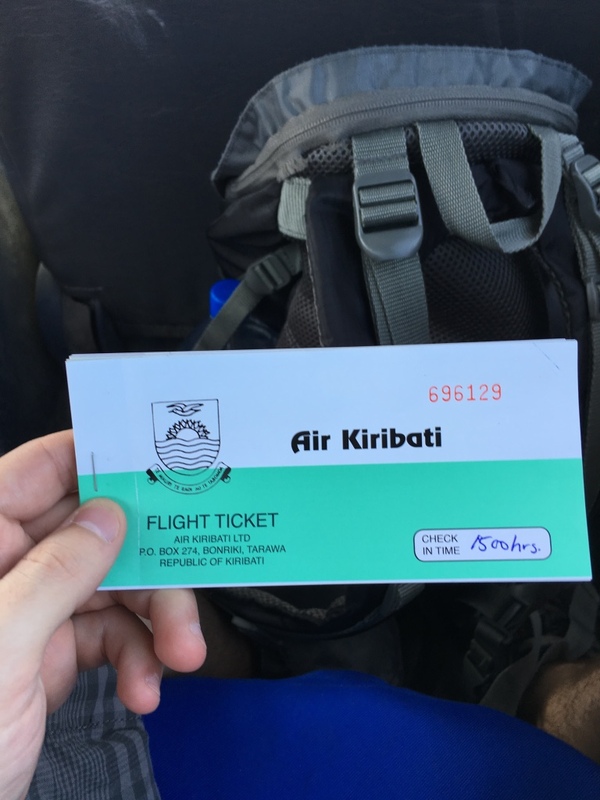 Overall, it was a great experience with Air Kiribati, all uncertainty was ultimately resolved and our time in Kiribati was unforgettable. While waiting for our flight to Majuro, I had the opportunity to have a great conversation with the head mechanic for Air Kiribati. We chatted about the upcoming addition of the Dash 8 and the (then) upcoming service in combination with Solomon Airlines linking BNE and HIR to TRW. Very interesting TR. I wish you would also share the earlier experience, from Brisbane to Tarawa in Nauru Airlines. Place seems a bit desolated, like no-one else is there, isn't it? Wow awesome TR. Its a very exotic airline! Nice to see a non fenced airfield. The bigger concern on many of the outer islands are children and animals on the runway. A patrol will chase/oust them or a simple go around? I'll echo Eiefel about the first part of the trip! An interesting report from a part of the world we don't see too many reports on. Very interesting. I was in Majuro a month ago and the relaxed island style still carries. I bet those sheep skin seat covers on the Twotter get really hot, really quick. your stayed at dreamers didn't you? How did you like it? Thank you for posting this informative and unique trip report. Excellent trip report. I spent a good part of my childhood living on TRW and it was great to read this. Nice work. Thank you for the kind comments! 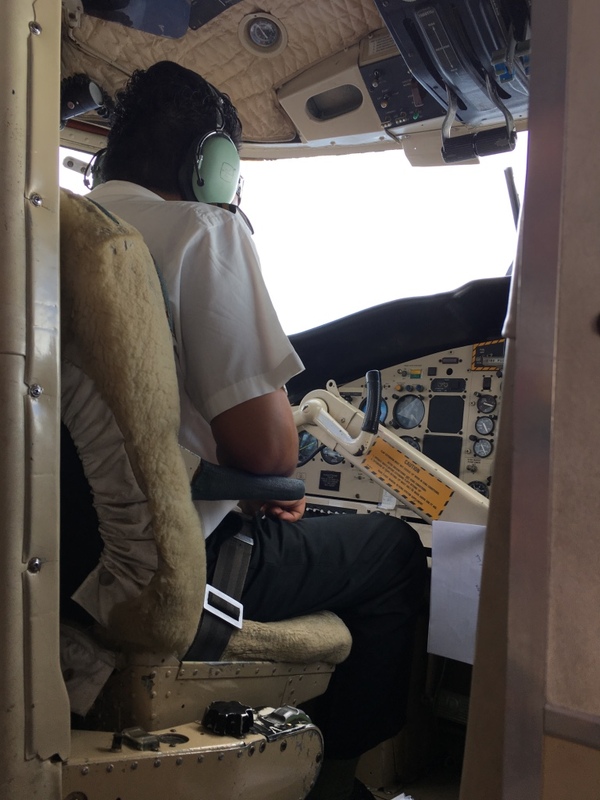 I'll see if I have enough photos from the Nauru Airlines flights to put together a report. I've flown them a decent amount-- both as 'Our Airline' and Nauru Airlines. We did! It's our usual base when we head to TRW. We love Dreamers; the owner is wonderful and while it is simple accommodation, it has all you'll need. I'm sure you had amazing stories from your time there. 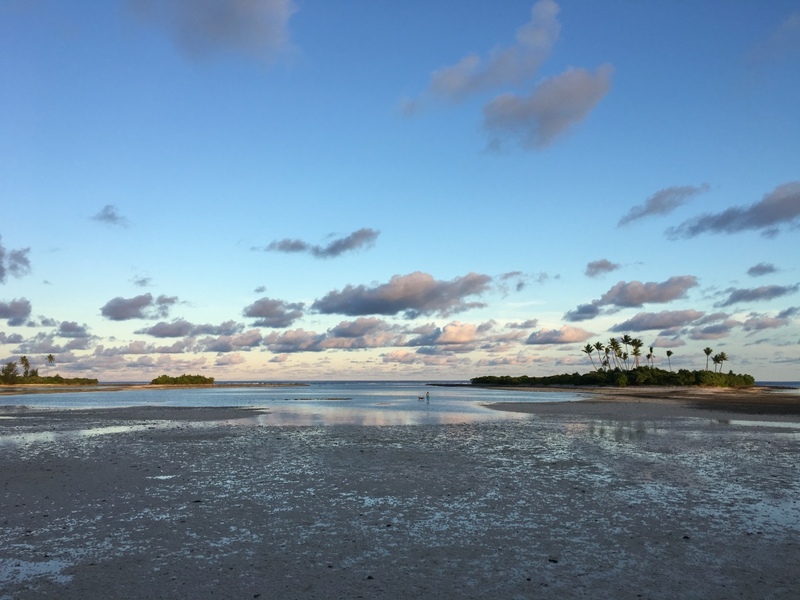 We fell in love with Kiribati and plan to visit again in the near future. Really good stuff thanks for posting!! Nice to see the lesser traveled areas in that part of the world. Funny that they have the IK code. I remember Air Pacific, of California, in 1979 was also IK. And they were also a DHT operator. Thanks for a fascinating report from a part of the world I would love to explore. 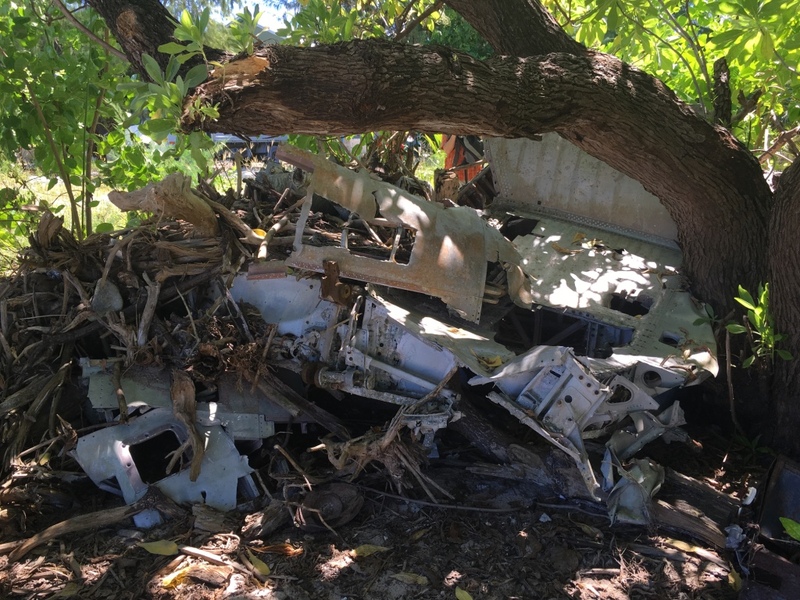 Brings back memories of when Kiribati had an international airline--Air Tungaru which flew a 727-100 Tarawa-Christmas Island-Honolulu in the early 1980s.